Building a deck in Michigan and elsewhere in the U.S. legally requires a building permit. There are also other compelling reasons, beyond building department legalities, for getting a permit before construction begins. Going through the building permit application and inspection process may sound intimidating, but Custom Deck Creations takes care of all of this in the background for you so you don’t need to worry about any of it. But some people still wonder, why or when is a permit necessary, and how does it benefit me? The counter argument may say that going through the permit/inspection process costs money and delays the project. A deck permit in reality costs only ~$300 – far less than any future costs you’ll encounter when needing proof of a code compliant deck when it comes time to sell your home, for example, or if someone is injured on an unpermitted deck at your home. And at Custom Deck Creations, we’ve streamlined and refined our processes with local building departments that often times inspections are scheduled for and done on the same day that that particular construction phase is complete – not delaying the project one bit. Here are some of the many reasons getting a permit is one of the first steps we always do when building a deck. If you build a deck without a permit, you’re simply breaking the law. While skipping the permit process may sound like a way to save money in the short-term, an unpermitted deck can cost you even more money in penalties, retroactive re-building fees, and legal expenses down the road. If an unpermitted deck is discovered by building authorities, they will order an inspection on it, assess a fee for an unpermitted deck, and/or even order you to take it down completely, especially if the deck is not built to building code specifications or is unsafe as a result. A situation like this would be vastly more expensive than the cost of a building permit prior to starting construction in the first place. The building code may sound like just another way for state and county officials to make money, but in reality, building codes serve a critically important purpose of public safety. Building codes have been around for thousands of years. The earliest one on record is in the Code of Hammurabi, written in 1754 BC. More recent building codes were originally developed because many structures were built in unsafe ways, creating serious fire hazards. Due to these former un-structured building methods, houses, apartments, and commercial buildings often lacked adequate ways for people to get out, known as egress, of the building in the event of fire. This unfortunately resulted in many needless deaths and injuries, and as a result, the first Uniform Building Code was published in the U.S. in 1927 with a primary aim of preventing deaths and injuries from building fires. Since then, building codes have been expanded and refined, covering all aspects of commercial and residential construction, including structural integrity, plumbing, electrical, mechanical systems, and yes even decks. Decks have become a particular area of focus in the code book due to the recent upswing in injuries from unpermitted decks. At Custom Deck Creations, we focus on decks and patios, and are extremely fluent in the code. All of our decks and patios are built to exceed the latest Michigan Residential Codes. Building codes related to deck construction cover such considerations such as how far apart supporting posts must be placed, the dimensions of structural beams and joists, the thickness of planking, the height and design of railings and stairways, the approved types of fasteners and connectors, the weight a structure must be able to support considering both material weight and live weight like people, furniture and snow, the number of inspections required, spacing for railings to prevent children crawling through or climbing up railings, handrails and landings for stairs, etc. These regulations assure that decks are structurally sound and safe. Fire safety also comes in to deck construction. Stairways must be built to allow for easy egress in the event of a fire. Also, if structural beams and decking are not sized adequately, the deck will burn more quickly and may spread more easily to adjoining buildings. When you hire a licensed contractor such as Custom Deck Creations, getting a permit further protects the homeowner – permits assure the customer that their contractor is not cutting corners or skimping on materials while completing the project. Never work with a contractor who does not pull the permit for you. This type of contractor is likely not licensed, is trying to save money (where else will they cut corners? ), and won’t be building a quality deck for your family. When a contractor asks you to pull the permit for their work, you’re all of a sudden the one responsible for the deck structure and construction – not the contractor. Your licensed contractor should always be the one to apply for and pull the permit. While complying with building code laws is only one of the reasons for getting a permit, there are other important reasons beyond this. No one would want to build a new deck and then discover the railing spindles were spaced in such a way a child could get his or her head stuck between them. No one would want a deck with planking so thin that a person’s foot could break through the boards, causing an injury. No one wants to worry about a deck collapse, unfortunately happening more and more these days due to unpermitted decks, causing unnecessary injury and death. When you build a deck to building code specifications, you don’t need to worry about any problems like these. The building code requirements for decks are designed with care and attention to structural and safety details in order to prevent injuries and accidents. Building a deck, or any construction for that matter, without a permit and therefore without a building inspector’s inspection(s), nearly guarantees the structure doesn’t meet safety code. Building codes were developed through experiences and learnings of the past. If something is required by the code, the reason is likely to be because someone was either injured or killed, or significant property damaged occurred, without this requirement being in place. Your legal liability is another issue. 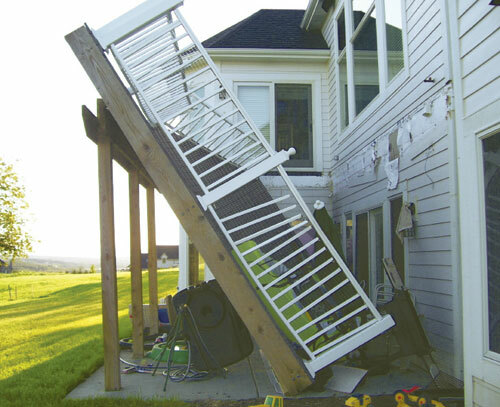 If your deck is not built to code/not permitted and someone gets injured on your deck, you may be open to a lawsuit for having an unsafe and unpermitted structure. Such a lawsuit could come from the injured party themselves, or the building and planning department may find you liable for illegal deck construction. It is bad enough if someone sustains an injury on your property, but if this injury is the result of a deck built without a permit, the problems and liability issues can become much worse. An injury occurring on a deck built without a permit may also result in your insurance company refusing to honor your policy. In this case, you will become personally responsible for the medical costs of the injured party. Further, say your grill catches on fire on an unpermitted deck and burns down the house, your insurance provider may even use this as an excuse for denying coverage. Building a new deck is an investment in your home, and you want to recoup this investment if you ever sell the property. In fact, when it comes time to sell your home, most homeowners experience an 80% ROI on the original deck investment – if permitted. However, if you put your house up for sale and you have added a deck without a building permit, you may be in for an unpleasant surprise. Many counties and local municipalities have actually begun using satellite images for examining properties from year to year, revealing add-ons done without permits. These illegal additions are often discovered when the property title changes hands, making fines, penalties, and lawsuits more likely. This is the last thing you want when you are trying to sell a home. Even if satellites don’t catch an unpermitted addition, if the deck was built illegally it may actually reduce the home’s value. Building permits are public record, and title companies, or even an astute buyer, may do their own investigation on a potential permit before closing the purchase on your home. This could lead to the buyer requiring retroactive permits and a Certificate of Occupancy to assure the deck is safe and legal. Or, the buyer may offer a lower price or back out of the offer completely. Buyers of homes can also require the seller to sign a Property Disclosure Statement. This document requires the seller to reveal any known problems with the structure. If the buyer later finds out a deck was built without permits and they were not told about it, they can then take legal action whenever they discover this fact. Custom Deck Creations takes care of every step of the permit and inspection process. We do all the work of the permit application, creating the required meticulous 2D blueprints of the project, securing plan review approvals, inspections, any necessary re-inspections, coordinating with the township/city throughout construction, and making sure you receive the final Certificate of Occupancy for your new deck when it is complete. All of our decks and patios meet and exceed the most current Michigan Residential Building Code. The Certificate of Occupancy is a document provided by the building department at the end of a permitted building project. This is your document proving your deck was built legally and is in compliance with all current building codes. If you ever sell your home, you will be asked for this document by the real estate agent, buyer, or title company. Getting a building permit in Michigan starts with an architectural design and blueprint showing exactly how the deck will be constructed. The size and location of posts, joists, beams, stairs, railings, pergolas, and all other framing and decorative features are drawn to scale, and the types of building materials are specified. There is also a plot map showing exactly where the deck will be located in relation to the house and property lines. Your contractor then takes these drawing and specifications to the building or planning department in your municipality. Depending on where you live, this may be a state, county, or local authority. After the contractor fills out and submits an application along with the drawings and specs, a review of these documents is conducted by planning and building officials, making sure all zoning and structural codes and regulations are met. When these reviews are complete, the building department issues the building permit to the contractor. The contractor can then begin construction, adhering to the required inspections along various phases of build. For example, when building a deck, the building inspector must inspect the excavated post holes prior to any cement being poured. A second inspection may be required after all framing is complete, but before any planking and railings have been installed. A final inspection is then done when the project is 100 percent finished. At this point, the Certificate of Occupancy is issued, and you can start enjoying your new deck. Now what happens if you have a deck and building codes later become more stringent? Do you have to go back and make changes to bring the deck up to the new code? The answer is no. Once your deck is built to the current code, it will continue to be a legally built deck, even if codes change in the future. However, it is a good idea to have your deck inspected after the first five years of use, and every three years thereafter, to be sure there are no problems developing. This inspection can be done by a licensed home inspector or contractor. Custom Deck Creations offers free deck inspections, anytime of the year, even if we didn’t build the deck originally. When you hire Custom Deck Creations, you won’t have to worry about questions like, “How do I get a permit and ensure my deck will meet current safety standards and building codes?” We take care of all architectural drawings and specifications, the building permit process, HOA approval if applicable, and scheduling of Miss Dig inspections. You don’t need to worry about a thing. Your job will be enjoying your new deck to the max, knowing it is legal and safe. Call or email today for your free deck or patio design! We’re a licensed and insured local Michigan company. Free quote and design consultations available most days and evenings – email or call us and we’ll set up a time to come to your home. Financing also available. Capped Composite: The New Alternative to Wood Decking What is Capped Composite Decking?